Chevy TrailBlazer is a stalwart of the SUV market, ranking as second-best selling SUV in the United States in 2006 and one of the top 20 vehicle sellers for the entire industry. A value-driven combination of standard comfort, convenience and safety features, along with proven capability, contribute to its success. The TrailBlazer lineup is headed by the performance-bred TrailBlazer SS, a sell-out star that offers sports car performance combined with the functionality expected of a utility vehicle. TrailBlazer SS has unique exterior styling and specific interior appointments, including prominent 20-inch flangeless wheels. Power comes from the LS2 6.0L V-8, which produces 390 horsepower (290 kW) and 395 lb.-ft. of torque (535 Nm) � enabling the powerful SUV to reach 60 mph in 5.7 seconds. A performance suspension with lowered ride height also is part of the package. 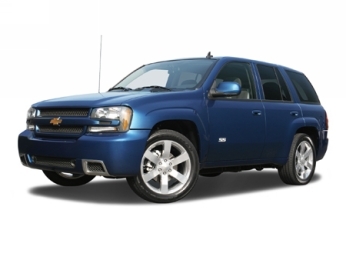 The TrailBlazer SS is available in two-wheel drive and all-wheel drive configurations. Beyond the visceral SS, the TrailBlazer stable includes the well-equipped LT model, which is offered with available V-8 power and all-wheel-drive. GM�s fuel-saving Active Fuel Management (AFM) technology is standard with the available Vortec 5.3L V-8 engine. AFM regulates between eight- and four-cylinder power to produce up to 5 percent improved fuel economy in certain light-load driving conditions. TrailBlazer is built for utility, first and foremost. To that end, it offers generous cargo room. Cargo volume is 43.7 cubic feet (1,237.5 L) behind the rear seat and 80 cubic feet (2,265 L) with the rear seat folded. Across the model range, the �08 lineup includes more standard equipment and three new exterior colors. The new standard equipment includes XM Satellite Radio and head curtain side air bags on all models (previously they were available on some models). The new colors include Dark Cherry Metallic, Black Granite Metallic and Desert Brown Metallic. Also, revisions have been made to the retail equipment packages. The class-leading standard engine in TrailBlazer continues to be the award-winning Vortec 4.2L I-6, which produces 285 horsepower (213 kW)* and 276 lb.-ft. of torque (374 Nm). * Also offered is the Vortec 5.3L small-block V-8, which includes Active Fuel Management. It is rated at 300 horsepower (223 kW)* and 321 lb.-ft. of torque (435 Nm). * Regulated voltage control for the Vortec 4.2L and Vortec 5.3L engines enhances fuel economy by reducing the load on the engine generated by the alternator. Powering the TrailBlazer SS is a 6.0L V-8 LS2 engine; it is rated at 390 horsepower (290 kW) and 395 lb.-ft. of torque (535 Nm). The Hydra-Matic 4L60 electronically controlled four-speed automatic transmission is matched with both the Vortec 4.2L and Vortec 5.3L engines. The TrailBlazer SS�s transmission is the heavy-duty Hydra-Matic 4L70 four-speed automatic. TrailBlazer uses hydroformed steel frame side rails, which form a strong foundation for the trucks� overall strength and solid feel, even on unpaved surfaces. A five-link rear suspension and independent, double-A-arms up front work with a system of 12 specially tuned body mounts using hydraulics and rubber pads to dramatically reduce vibration and harshness on any kind of road or trail. Four-wheel ventilated anti-lock disc brakes are standard. An Autotrac four-wheel drive system is standard on 4WD models. StabiliTrak is standard on all models. StabiliTrak helps drivers maintain control during sudden maneuvers or in low traction conditions by using a comprehensive series of sensors to measure acceleration, deceleration, steering angle and yaw rate. By monitoring these inputs, the system automatically controls the vehicle to help maintain the driver�s intended path when a measurable deviation from the intended course is detected. The system maintains control by regulating vehicle acceleration or applying the brakes at any wheel. For example, if the vehicle begins to understeer, StabiliTrak applies the inside rear brake to help turn the vehicle. If the vehicle begins to oversteer, StabiliTrak applies the outside front brake to straighten the vehicle. All models feature low-drag brake caliper design. TrailBlazer has GM�s Passenger Sensing System (PSS). PSS uses the latest sensing technology to turn the front passenger air bag on or off. If the sensor system detects an unoccupied front passenger seat or the presence of a smaller occupant, the front passenger air bag is designed to automatically turn off so it will not deploy in the event of a frontal collision. A status indicator on the instrument panel alerts occupants that the passenger air bag is on or off. Even with this system, GM strongly recommends to restrain child passengers in an appropriate child seat placed in the second or third row of the vehicle. Never install a rear-facing infant seat in front of an active air bag. GM also recommends that all children 12 and under ride in the rear seat when possible. TrailBlazer also has standard pretensioners in the outboard front safety belt system that deploy at the same time as the frontal air bags to take up slack in the safety belt webbing. Pretensioners also help reduce the amount of occupant movement in the event of a crash to help reduce the risk of injury. Standard head curtain side air bags act like a protective curtain when deployed, unfolding from the roof rail between the A-pillar and side window header. When the bag deploys in a moderate to severe side impact, it is angled somewhat toward the window to help provide protection for front- and second-row outboard passengers. In vehicles equipped with head curtain side air bags, a new rollover protection sensing system helps protect occupants in a rollover event by triggering both the side curtain air bags and safety belt pretensioners. The rollover-sensing module, located on the center tunnel under the rear seat, uses a complex algorithm based on lateral and vertical accelerations, roll rate and vehicle speed to determine whether to deploy the safety systems. TrailBlazers are equipped with LATCH (Lower Anchors and Tethers for CHildren) system for child safety seats in all second-row seats. The LATCH system provides two lower anchors and a top tether anchor to be used to secure a child seat to the vehicle seat structure. These anchorages are designed to make it easier to properly install compatible child safety seats. An enhanced front passenger safety belt reminder system also is standard. All TrailBlazer models come with OnStar Generation 7 (with one-year Safe & Sound service). The service includes the General Motors Advanced Automatic Crash Notification (AACN) system, making crash data available to the participating 911 centers to help them dispatch the appropriate live-saving personnel and equipment to crash scenes faster. Available options on TrailBlazer include a power sunroof, rear-seat DVD entertainment system and Bose premium speaker system. Also available are adjustable brake and accelerator pedals, inside rearview mirror with temperature gauge and compass, leather seating surfaces with eight-way-power driver and passenger seats, sunroof, and both factory- and dealer-installed running boards. Available entertainment and information features also include a Navigation Radio. It incorporates a dash-mounted GPS system and display with the vehicle�s sound system. TrailBlazer SS is a serious performer and a capable midsize SUV. Riding on a one-inch-lower suspension, the TrailBlazer SS�s suspension was tuned and tested on the racetrack to deliver responsive, balanced handling. The lower ride height reduces the vehicle�s center of gravity, improving overall handling. This was accomplished with new springs at all four corners. The springs are up to 25 percent stiffer, which complements the lowered ride height with a firmer feel and reduced body roll. Corner control and body roll control also are improved with front stabilizer bars that are approximately 10 percent larger in diameter than other TrailBlazer models. StabiliTrak electronic stability control is standard. The four-wheel disc braking system of the TrailBlazer SS is enhanced with larger, 12.8-inch front disc brake rotors and iron twin-piston calipers. The heavy-duty iron calipers are stiff and retain their shape under high pressure/high heat braking conditions, providing a more linear feel and reduced pedal travel in high-energy stops. The brake pads use the same high-performance linings as the Corvette for strong fade resistance. ABS is standard. There also is an accessory front brake cooling package available for optimized track performance. With TrailBlazer SS�s brakes, tires and revised ABS algorithm, 62 mph to 0 (100 kph to 0) stopping distance is approximately 135 feet. Under the hood of the TrailBlazer SS is the LS2 6.0L V-8. It is rated at 390 horsepower (290 kW) and 395 lb.-ft. of torque (535 Nm). The LS2 6.0L is based on the small-block V-8 architecture and delivers satisfying down-low torque for strong off-the-line performance. Torque is inherent to the engine�s cam-in-block design, large 4.00-inch-diameter (101.6 mm) bores and 3.62-inch (92 mm) stroke. Response is crisp and immediate, thanks to the electronically controlled throttle. Unique to the TrailBlazer SS�s version of the engine is a composite intake manifold used in other midsize trucks and adapted to the LS2 to help produce balanced torque and horsepower within packaging parameters. The engine also has the TrailBlazer�s trademark pass-through oil pan. The pan�s cast-in passage allows the front differential�s half-shaft to run through the pan instead of under it. This helps keep the engine mounted lower in the chassis for better balance and a lower center of gravity. There also is a stylish SS-specific engine cover, radiator support cover and coordinated air induction box. Backing the 6.0L V-8 is a new Hydra-Matic 4L70 electronically controlled four-speed automatic transmission. It debuts in the TrailBlazer SS and was developed to handle the high horsepower and high torque loads of performance-oriented light-duty vehicles. Special high-strength and heat-treated materials are used in the 4L70 to ensure it delivers smooth, dependable shifting. A performance-oriented all-wheel drive system is available, giving the TrailBlazer SS impressive on-road grip and enhanced �launch� feel. The always-engaged system uses a Torsen center differential to split torque between the front and rear wheels. It is a torque-bias system that detects low traction at one axle and directs more torque to the other when needed � it is capable of changing the normal 67-percent rear-axle torque bias up to 45/55 (front/rear) or 25/75 (front/rear), depending on the road conditions. As with all Chevy models wearing the SS badge, the promise of the TrailBlazer SS�s performance specifications is reinforced by authentic design cues. For this midsize SUV, that means a tight, sleek look and a monochromatic color scheme, with sporty front and rear fascias, a racing-style black mesh grille and large, bright exhaust outlet exiting beneath the rear bumper. The TrailBlazer SS also has been stripped of body side moldings, the roof rack and other cladding that adds visual weight to the vehicle. The rear pillars are blacked-out, blending with the tinted glass for a more integrated, wraparound style. The mirrors, door handles and grille cross bar are painted body color, too. Six exterior colors are available: Black, Olympic White, Red Jewel Tintcoat, Imperial Blue, Silverstone and Black Granite. Inside, a driver-oriented �cockpit� features a SS-signature instrument cluster, including a prominent tachometer. The silver-face tachometer has black numerals, a signature SS item. Other SS-specific cues include embroidered seat backs and the leather-wrapped steering wheel. Performance-style front bucket seats are standard and feature firm �wing� bolsters to help keep the driver and front passenger planted during spirited driving. Cloth seating is standard and leather-appointed seating is available. And because SS means style as much as performance, the TrailBlazer SS�s refinements include a French seam stitching on the console armrests, aluminum sill plates and numerous chrome accents. A T-shape shifter with a satin nickel accent also distinguishes the vehicle�s cabin. TrailBlazer SS also delivers the capability expected of an SUV: The towing capacity is up to 6,800 pounds (3,084 kg) with the two-wheel drive model and up to 6,600 pounds (2,994 kg) with the available all-wheel drive model.